The Rock Academy's robotics program called FIRST (For Inspiration and Recognition of Science and Technology) is comprised of high school student competitors. All students who choose to participate in FIRST are asked to practice "Gracious Professionalism." Gracious Professionalism is used by everybody in FIRST. It encourages students to help other team members, even if it might give your own team a disadvantage. Whether it is lending your opponent a battery or helping an older gentleman cross the street, every team is involved with "Gracious Professionalism." To help the Warriors reach their goal of participating in the world championships, the team participated in "Gracious Professionalism" by hosting a scrimmage at the Rock Academy. The highlight of Saturday's scrimmage was when teams participating within the blue alliance won the scrimmage and demonstrated "Gracious Professionalism" by congratulating the red alliance. The overall event was designed to encourage other teams to build robots, while promoting unity among the high school student community. By the end of the match, participants filled out comment cards and left with smiles on their faces. The Warriors FTC Team 4112 is a Christian Team from the Rock Academy and considered a veteran team in San Diego since it has been an established for more than a year. Last year, as a rookie team, the warriors went to the San Diego Championships, got fourth out of forty teams, and won the Judges' Award. This year, Team 4112 aims to compete in the world championships with a full team comprised of eight students. 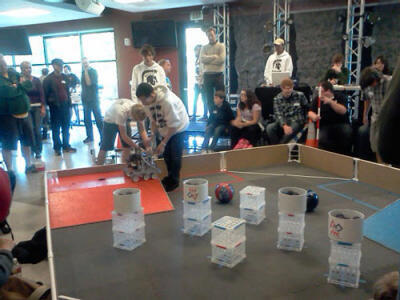 Many improvements have been integrated within the team's curriculum including: establishing a field for practice, building more efficient parts for the team's robot, utilizing a six-wheel drive, incorporating more intricate sensing abilities, and establishing a better team morale through teambuilding events. The warriors are going to be competing in the San Diego Championships on January 14th at Madison High School. More information regarding FIRST can be found on www.usfirst.org.